Okay, yes, I know prom season is over, BUT I never shared what I did for my prom makeup. It was really pretty, and I was so happy with the way it turned out. My dress was all black so I really wanted to do something bold that would stand out and contrast well with my dress. Below are the products I used!! Prom was SO fun!!! I really liked my makeup and hair and everything just ended up working out really nicely. I hope y'all enjoyed this post!! The picture of my look is up above!! If you went to prom, let me know what products you used and how you liked them!!! I'm always looking for new products to test out. PS: Graduation is in 41 days!!! Spring break is finally here, but before I go on break I wanted to give y'all a short little list of some new products that just arrived at Sephora. I've barely watched any reviews on them on Youtube but y'all know how it is. When something new comes out you gotta try it!!! Here's the list of products I think are worth the try!!! Okay so to be honest that last brand I've never heard of, but I personally think that new brands or unheard of brands deserve just as much hype as the really well-known ones. Anyways, I hope everyone has a great break!!! A few weeks ago I attempted to make french macarons for the first time EVER. They actually turned out better than I thought they would, and it made me really happy. I will admit that I had to look up how to tell the difference between soft, firm, and stiff peaks when it comes to whipping egg whites, but in the end it turned out really well!! Overall, when I made them, my family seemed to enjoy them. None of us really knew what macarons were supposed to taste like, so we really had nothing to base it off of. It's sorta like how you know what a chocolate chip cookie generally tastes like, so you know whether one you try is good or not. I think I will more than likely make these again to practice my technique. Anyways, here's the recipe y'all. 2. Prepare a piping bag with a 1/4" opening, and line a baking sheet with parchment paper. 3. In a medium bowl, sift almond flour and powdered sugar together. Set aside. 4. In a stand mixer with a whisk attachment, beat the egg whites on high speed until they form soft peaks. Stop the mixer, and add in sugar. 5. Turn the mixer back on, and beat the egg whites to stiff peaks. Before it's at stiff peaks, add in your food coloring. 6. Take the bowl off the mixer and add in the almond flour and powdered sugar mixture. Mix BY HAND until the batter starts to loosen. To test if the batter is ready, lift a small amount of batter from the bowl and let it drop back into the batter. If it melts back into the batter within 20-30 seconds, it is ready. 7. Put the mixture into your prepared piping back. Pipe 1 1/2" circles on the prepared baking sheet and lightly tap to bottom of the tray so the batter evens out. 8. At this point you can add sprinkles, then let the macarons "rest" for 30-45 minutes, so they can form a skin. 9. Once they form a skin, bake for 10-12 minutes or until set. 1. In a stand mixer with a paddle attachment, cream the butter until it is soft and smooth. 2. Add powdered sugar, milk, and vanilla until light and fluffy. I hope this recipe works out well for y'all like it did for me!! Have a great weekend y'all!!! I hope everyone had a great second winter break, but it's definitely time to get back into the swing of things. 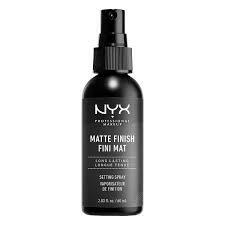 Over the past few months, I've been trying out the NYX Matte Setting Spray. It retails for $8.50 at Ulta and has a rating of 4.3 stars on their website. Overall, I have really enjoyed this setting spray. It gets the job done; however, I personally don't think it's anything special. It's pretty much like every other setting spray I've ever owned. The mist comes out pretty strong, and a few sprays can really drench your face. I literally have beads of setting spray leaking down my face from my eyebrows sometimes, lol. I personally think that the setting spray does what its marketed to do: mattify. Because of its matte finish, it increases the longevity of the wear of my makeup, which I like considering I have school then work five days of the week. I'm also pretty sure I've gone through a whole bottle of it and bought another one, so it's a pretty decent purchase if you ask me. As a person with a combination skin type (leaning more towards dry), the only downfall for me personally is that it may have irritated this one dry patch I consistently get on my left cheek. I typically don't put any makeup on that side of my face just for the sheer fact that I don't want to emphasize the texture, but I don't really know if the setting spray had a negative effect on my dry patches. Overall, though, I really enjoyed this product and will probably continue to use it. Although I am not one who enjoys Valentine's Day that much, I do like to bake for other people that I love because it makes me happy. I think I did this for Halloween too, so I'm just going to do it again for Valentine's Day. Here's a few pictures of ideas you could take inspiration from for a sweet Valentine's Day treat. I hope these ideas can help y'all get some inspiration for Valentine's Day!! Even if you're like me, and you don't have a valentine this year, you can always make the best of it by shoving your face full of really yummy food!!! Lol, jk. I'm like really excited to see what else comes out this year because I'm ready for some new makeup y'all!!! I think I'm most excited to go and purchase the Fenty concealer because I've been hearing some really good reviews on it!!! Have a good weekend you guys!!! I hope everyone enjoyed their winter break because I know I definitely did. Over the break, I decided to make this recipe for blondies and they were SO good!! It made the house smell like homemade syrup; I'm assuming it's from the abundance of brown sugar in the recipe, but yeah, my family totally devoured these. 1. Preheat the oven to 350 degrees Fahrenheit. Spray a 9-by-13-inch baking pan with PAM or butter. 2. Whisk the flour, baking powder, and salt together in a medium bowl and set aside. 3. In another bowl, whisk the melted butter and brown sugar together until combined. (i personally enjoy using a stand mixer with the paddle attachment, but you do you boo) Add the vanilla and eggs. 4. Fold the flour mixture into the wet ingredients. (again, you can use a stand mixer) DO NOT OVERMIX!!! IT WILL MAKE YOUR BLONDIES TOUGH AFTER BAKING THEM!!! 5. Bake for 20-25 minutes or until the top is a light golden brown. Once done, sprinkle the blondies with flaky salt and serve. I personally really enjoyed eating these blondies. You can add so many different ingredients to customize them to your liking. Typically people will add walnuts or bittersweet chocolate chips. Anything will work, really. I hope you try this recipe out!! So a few weeks ago, I posted a pumpkin bread recipe, but I told y'all that I had never made it before. I actually decided to try and make it for Thanksgiving, and my family LOVED it!! They literally took such big slices because it tasted so good. The only issue I ran into when making it was that I left it in the over at 350 degrees fairenheit for 65 minutes, and the center was still a little raw towards the top. I left it in for another five minutes, making the total bake time 70 minutes, but it was still the slightest bit raw. I decided to just take it out of the over anyways because I assumed maybe it would harden a little as it cooled off. It did a little bit, but not as much as I thought it would. Overall, I really recommend this recipe for holiday parties because it was super yummy!!! In other news, I was recently accepted into Johnson and Wales University in Providence, Rhode Island to major in Pastry and Baking Arts, and I'm so EXCITED!!! I will start school there next September, and I'm so ready to expand my knowledge of pastry and bake new goodies!!! As much as the quality of makeup products matters, the brushes you use impact the overall result of your look as well. Although there are no rules in makeup, certain brushes work better for certain things, like how a big fluffy brush is better for applying powder rather than blending in foundation. Today, I am going to give y'all a list of brushes for each step of a full glam makeup routine that you can purchase!! Foundation Brush: Typically, you would want a foundation brush that is dense so it doesn't soak up all the excess product. Good foundation brushes can be hard to come by because some can leave your makeup looking streaky. Majority of makeup lovers blend their foundation in with a makeup sponge, which works better than a brush. Concealer: You can use the same brush that you did for your foundation, but instead of rubbing motions, use dabbing motions to get an even blend. Most artists prefer to utilize a sponge during this step as well, so I'm not going to link a product. Powder/ Bronzer: Like I said in the intro, powder brushes are big fluffy brushes because if you use a dense brush, it is going to make you look all cakey and gross, which of course we don't want. I like to use my powder brush for my bronzer as well just to save myself the aggravation of having to wash more brushes. Contour: Contouring is one of the only steps of a full glam makeup that you want to be somewhat harsh. To achieve this look, using a flat, dense brush will really pack a punch with a good contour shade. Just remember to blend it out so it doesn't look like you have a big line on your face. Blush: The best blush brushes are smaller fluffy brushes that disperse the product without making it too harsh. Dense brushes are not ideal for blush because it would put way too much pigment on the cheeks. Angled contour brushes and mini fluffy brushes are the best for achieving a natural blushed cheek. Highlighter: Similar to blush brushes, highlighter brushes need to be small, but somewhat dense. Highlighter is in a more concentrated area than say blush or bronzer, and you don't want your highlighter getting on parts of your face that you already powdered down. The Morphe 510 brush is my personal favorite for applying highlighter. Eyebrows: The only thing you would use an eyebrow brush for is pomade. My favorite eyebrow brush is so cheap that it seems impossible that it would be such good quality. This brush has a perfectly angled tip with a spoolie on the other end, which saves y'all money on buying an extra brush. Eyeshadow: One thing that everyone needs in their brush collection is a GOOD blending brush. Eyeshadow is an art of blending shadows together and without it, your look might end up looking muddled and messy. I hope these brush recommendations were helpful. A good makeup look does truly start with the tools that you use, so just remember to keep that in mind. There are good brushes out there that are off brand, and it's easy to find them on Amazon, Morphe, and other websites. I hope y'all have a great Thanksgiving!! With spooky szn officially over :((( it is now the holiday season!!! I am so beyond excited because I have so many ideas for things to bake and share with you all!! To kick off the holiday season, I'm going to share a pumpkin bread recipe with you because it brings back memories of my childhood. My mom, sister, and I would make pumpkin bread together all the time when I was younger, and I used to love it so much!! We used to buy a box mix of it, but now I make mine from scratch. This recipe is not mine, it is from a website called my baking addiction, and I really recommend y'all check it out because she is crazy talented!!! I hope y'all try this recipe!!! It's really good!!! You can add nuts or fruit into the batter and even put some homemade whipped cream on top!! Enjoy!! Use a sponge and then a brush to blend out your foundation to make sure it is blended to perfection.